Are you interested in giving your students an opportunity to learn and practice stoichiometry using web-based tutors? And, at the same time, participate in a learning science experiment? Your students will use special web-based intelligent tutors known as Example-Tracing Tutors, a derivative of Cognitive Tutors that have been successfully used in over 2000 schools across the United States, to help them learn stoichiometry. You can either have your students use the tutors as an in-class exercise or as homework. My students can never have enough practice with stoichiometry problems and the tutorials were very helpful in teaching them what step should come next. Thanks for a valuable online chemistry experience for HS college prep students! 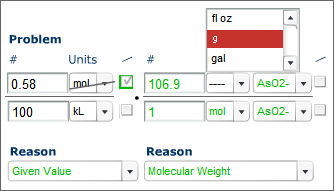 My students gained another perspective on the topic and increased practice time using the stoichiometry tutor. Thank you for the opportunity to use the program in conjunction with my classes! To have your students participate, contact Dr. Bruce McLaren at bmclaren@cs.cmu.edu. Dr. McLaren will discuss with you a good time period for your students' participation. To then start working with the problems, your students will go to a provided URL to register and start the work. The full set of problems takes between 2 and 4 hours to complete.